I love winter. Run me out of town if you must but I had to let it be known. The cold weather doesn’t particularly bother me and snow is exciting, but the real thrill for me is when the birds I only see in winter arrive. Now that winter birds are here, I change my feeding routine to attract these birds to my feeders. I also start scattering white proso millet on the ground under bushes, near the feeder, and near a brush pile. 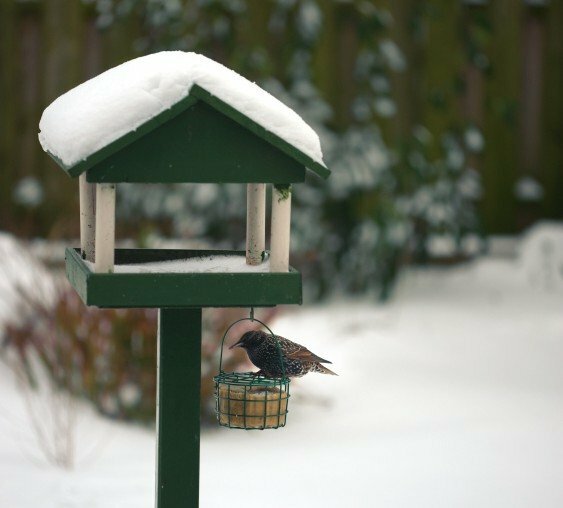 All the ground feeders such as the juncos, sparrows, towhees and doves appreciate this food source during the cold months. There is always suet available in my yard and in more than one spot. Suet is rendered beef fat mixed with other yummy bird treats such as peanuts; hot pepper suet keeps squirrels and raccoons away. This little square of fat provides an energy source, which the insects provided during the warmer months. Birds like pine warblers that don’t eat seed will go to the suet feeders for that energy source. Even a brown creeper will nibble at the suet on cold mornings. I also make sure I have sunflower hearts out for all birds to enjoy. The insect eaters (bluebirds, warblers, Carolina wrens) will be able to eat this offering. Their bills are not strong enough to crack open seed shells so they need to be able to find just the meat of the seed. I also make sure I have open water for them to drink. This is critical. Birds must have water to drink and, most importantly, to be able to bathe during even the coldest days. Clean feathers means the bird will stay warmer and will be able to get away from the hawks. The bird with the fastest get-away survives! So my birdbath heaters come out of the shed and get plugged in ready to go to work defrosting the birdbaths until warm April nights are back here to stay. Cover is also important. I make a large brush pile in the back of the yard and throw millet into the middle of the pile, which allows the birds to find food if the weather suddenly turns nasty or if they need to hide from a hungry cooper’s hawk or a neighbor’s cat. Birdhouses are used during cold winter nights so be sure to clean your houses out during this non-nesting season. Bluebirds and also chickadees, titmice, or nuthatches will use a bluebird house. And to all you gardeners, plant native. It was exciting when I noticed the birds had cleaned up the berries of my Beautyberry bush (Callicarpa). I know they got to enjoy a native shrub and a natural food source. I just wish I had been at the window when they had breakfast. Get out this winter; enjoy the chilly air and the birds that must work so hard to find food during the cold months. Good places to go birding in the Triangle are Falls Lake, Lake Crabtree, Butner Game Lands, Jordan Lake, Bond Park, Mason Farm and Duke Forest. Visit the North Carolina Birding Trail for more birding sites across North Carolina. Cynthia Fox owned the Wild Bird Center in Chapel Hill for 14 years and has been an active birdwatcher for close to 40 years.